The garage is home to many dangerous chemical substances, from fertilizers to pesticides to antifreeze. You may even have some of these items stored in old food containers or soda bottles. What you see as a convenience could be mistaken for something tasty to drink by an unwary child. This type of storage could also be hazardous if chemicals erode their thin, makeshift storage containers. Even if you contain them properly, chemicals give off fumes that can cause respiratory problems or increase the chance of fire in your garage. To fix this hazard, you should store chemical items up off the floor so a curious child or pet can’t find their way into these hazardous materials. Keep them in their original containers and lock them within a garage cabinet with other chemicals. Safely dispose of any chemicals you don’t plan to use in the near future. When it rains or snows, water is tracked into the garage, making the floor very slippery. Spilled oil or other liquids can also reduce traction and cause someone to fall. You can reduce this hazard by having epoxy floor coating installed. A decorative chip coating has a pleasing aesthetic appeal that will last for years to come, but it serves several important practical purposes as well, including acting as a non-slip surface. 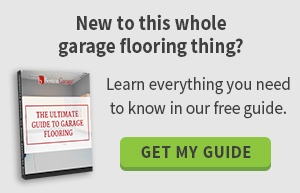 Even when wet, the slight gripping texture of epoxy garage flooring provides excellent slip resistance. It’s common to store sharp, heavy tools for gardening or handyman work in the garage. Do you have a dedicated home for these tools? If left lying around, they could create a tripping hazard. Your children could also find them and hurt themselves. The solution is to install a workbench off-limits to the kids. Whether you’re presently working or not, keep your power tools and hardware locked up inside the workbench. At Boston Garage, we can help you implement these garage safety tips with new custom cabinets, garage epoxy floor and a workbench. Don’t delay making your garage a safer place to work and play! To get started, schedule a free on-site design consultation.